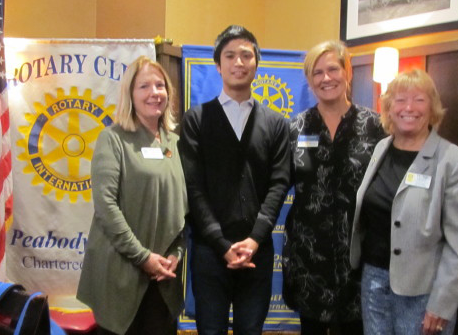 The Peabody Rotary Club is the host club of Rotary Global Grant Recipient, Kazuki Motohashi. Kazuki received his $30,000 grant from District 2750 and the Tokyo Akebono Rotary club. He is studying at Tufts University for a PhD in Economics and Public Policy. He is passionate about environment and development, clean water and sanitation around the world, particularly in Southeast Asia. He received a Bachelor of Laws degree from University of Tokyo in 2012 and a Master’s degree in Public Policy in 2014. He subsequently worked on environmental policy at the Mitsubishi Research Institute. Representing Peabody Rotary as host members to assist Kazuki while he’s in the area are President Stephanie Johnson and members Martha Holden and Peggy Pedro.